Village Vehicles (VVs) – made where? This article started life as Q+A 28. New information – see IDJ Jan 2016. Vicky Chan, Lamma resident, asks where Village Vehicles, more usually known as VVs (though there are apparently VWs) are made. She suggests they are so simple in design that the answer must be somewhere in Hong Kong. Is she right? And if so where exactly? 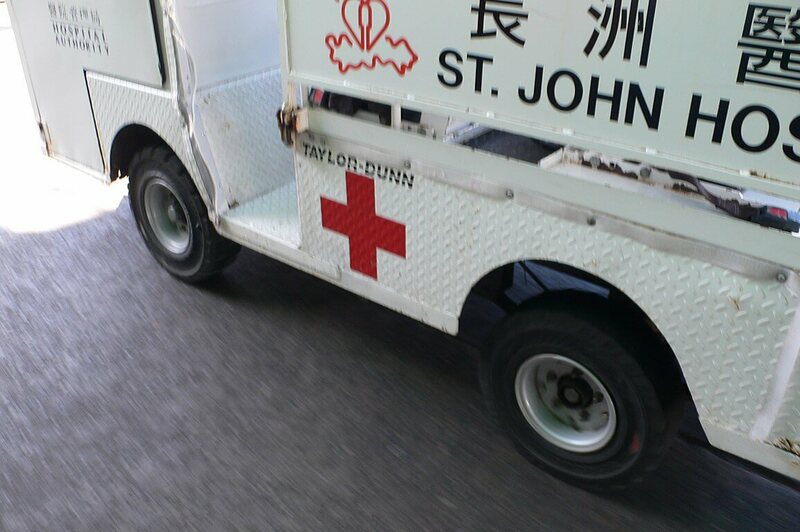 IDJ: While wandering around Cheung Chau recently [Nov 2015] I noticed that many village vehicles still retain manufacturers or ID plates on their structures. They seem to be riveted on the chassis near or below the battery boxes or on the steering column. 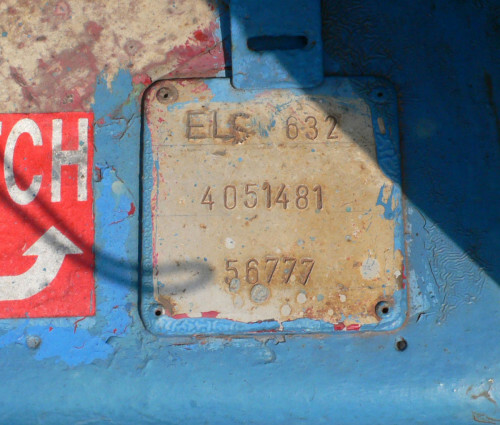 Many had no ID plates,presumably discarded over the years of wear and tear. 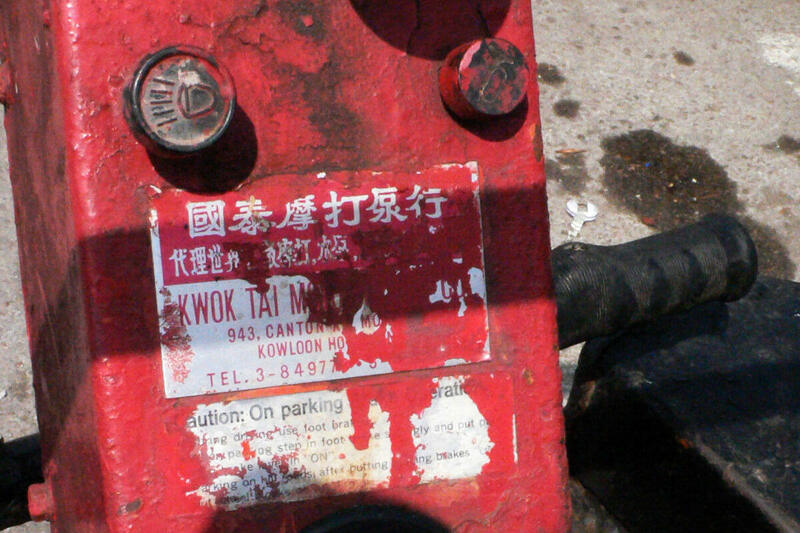 Kwok Tai Motor & Pump Company? HF: This extract from the Transport Department’s form TD 293 12/2012 Application for Village Vehicle Permit is vague about their manufacture…”Vehicle Make (if any)”… IDJ suggests there must be a HK Government preferred manufacturers listing of who can tender to supply/build them. This article was first posted on 12th February 2015. I have seen some more of these of an older design (and smaller whells) in Cheung Chau and Peng Chau in the past few decades. They are extremely noisy (could be as loud as those Harley Davisons having their exhaust modified to give deafening growls) and usually not well maintained. Driving them would leave behind lots of charcoal grey smoke. Some of them might not have a steering wheel like the one shown above. Some might actually be motorized tri-cycles and a cargo container at the back. Construction sites on the islands use them to carry bags of concrete or tens of bricks or other nitty-gritty things to and from the construction site and the ferry. Some farmers also use them when hauling heavy supplies to their farms. I believe they are allowed in rural areas where street traffic could not reach on some condition lay down by the Government. Have to look them up somewhere. I have inserted part of your comment into the main article. Have you any information about where any of the different versions are/were made? I really have no idea. 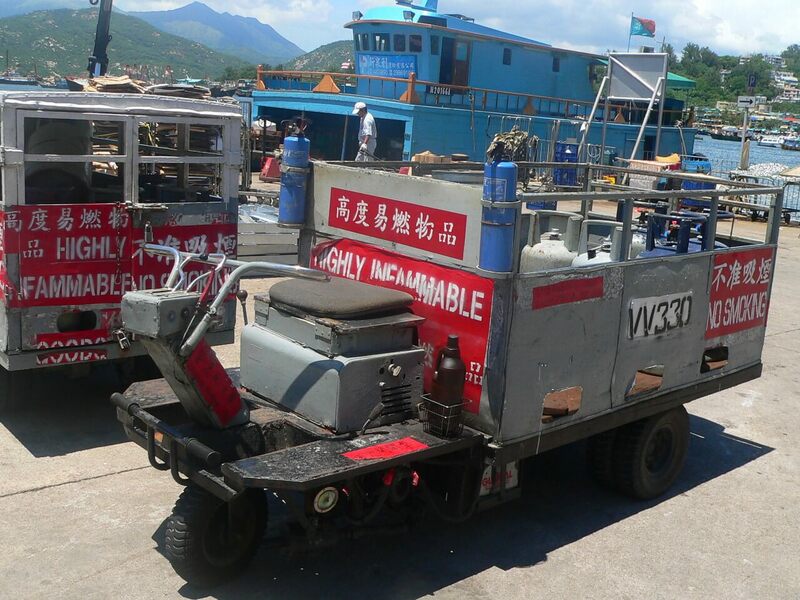 I googled Village Vehicles and got this TD293 document: (http://www.td.gov.hk/filemanager/common/tdforms/td293(2013.01).pdf) from the Transport Department. Looks like they have to be licensed now. I believe these vehicles may be called Utility Vehicles elsewhere. If this is the case, I guess there are many big brands producing these in different shapes and sizes. We could not rule out some might be assembled locally though. Better ask some other farmers :-P who use them for further information. A bit more information that I just remember. I have seen some versions of these vehicles that do not have a driver’s seat at all. 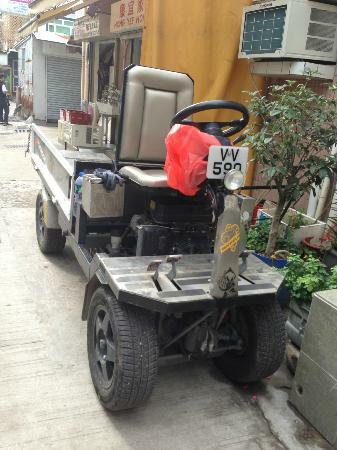 The operator just walk behind the vehicle, steering using tricycle look alike steer handles. That’s right, the cargo container (usually a small flat bed, maybe equipped with a rim) is in front of the operator. 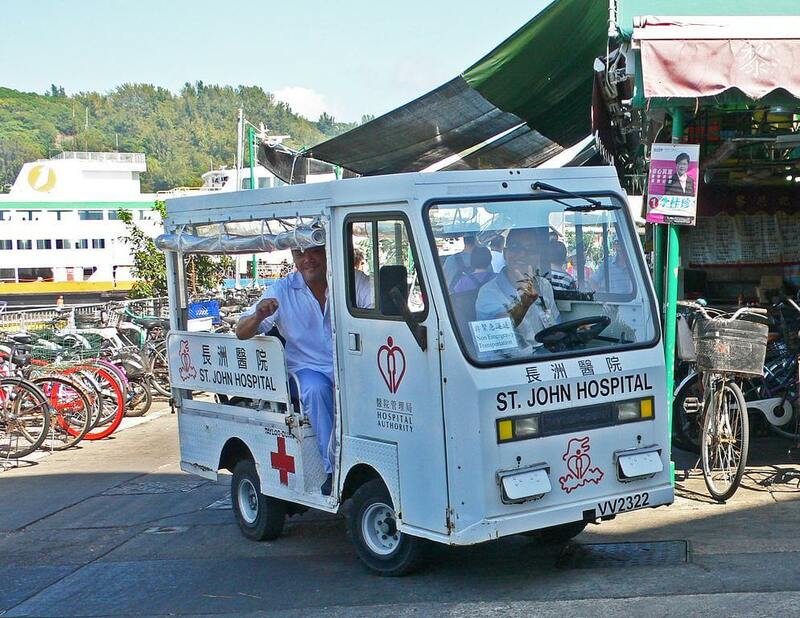 There was another type of Village Vehicle in use in the New Territories a few decades ago. These lorry buses were privately owned and provided transport for villages in areas not served by the major bus companies. Village vehicles or VV’S FOR SHORT ARE SO COOL DUDE! SO COOL! I have seen loads of village vehicles on my visit to cheung chau yesterday I saw 2 4 wheelers and the rest where 3 wheelers the colours were green red blue gray and white and blue the Gray one was from lamma island the I even saw the ambulance police and fire vehicles the white and blue one was from the canycom website http://www.canycom.co.jp/eng its name was shitamachikomachi J66 they were from japan showroom in fukuoka i’ve seen videos of it one youtube they were all in japanese so i could not read japanese but i can only read english there was 2 types: one was a delivery car the other was a small motorised dump truck the rest were seen at the start of the journey the green one turned round because it was going the wrong way it had bottles in it the wheels were green the red ones had white wheels and black wheels the tires were black it had a hook at the back for towing things like trailers it had garbage at the back and guess what you won’t believe it THE RED ONE AT THE BYCYCLE SHOP HAD ITS BED RAISED FOR MAINTANENCE!!!! Have you seen anything like that before? I have for the first time!!!! Oh dude this is so exciting when you go to Cheung chau you must see that. And by the way the red one is the most seen on the island because it’s rich to make that oh man how I wished I bought a house to see more!!!! But sadly I don’t have enough money and not old enough I am not a resident to cheung chau I would love to become one. I am a guest and I went cycling there I did not catch the plate number of the village vehicles but I know that they start with VV something the four wheelers were carrying cement and the other one was carrying bags of seafood cheung chau is a small island I know that Some of the 3 wheelers was a motorised delivery car they were a bit rusty but started up well a bit noisy the engine some were parked because it’s the end of the day they were almost everywhere goodbye!!! !